I fell in love with LeapFrog when TOF was about 3 months old. I bought their amazing bouncy chair at a garage sale for $10 and I realized that I had to have more of these great products. The Letter Factory VHS tape with Professor Quigley, plays nearly everyday while I prepare lunches. Last Christmas I bought TOF the Leapster and some games. So when I was given the chance to host a LeapFrog Party I nearly soi...well, let's just say I was very excited. The hardest part was hiding the box from TOF before the party. He knows that when FedEx delivers he gets to help Mema with her blog work LOL. The toys are sturdy and completely kid friendly. The LeapPad screen is a whopping 5" Making it perfect for kids and this Mema too. It's not like your typical annoyingly noisy electronic toy. We can finally get our Smart Phones back from the kiddos. There was only one thing about the LeapPad that we thought could have been better..the stylus is not attached by a cord. But the kids could easily use their finger if the stylus gets lost. The Tag Reading System also got a thumbs up from our guests. The two sided World Map is not only a helpful learning tool, it includes interactive learning games and fun characters. When used as a reading system, Tag brings books to life. Tag Reader holds the audio for up to 10 book that you can easily download from your computer. There is also an online game and a site for parents to monitor their child's progress and skills. With TOF in kindergarten this year, he's beginning to learn to read but still has a long way to go. The Tag Reading System will help him build the confidence he needs to become an independent reader. 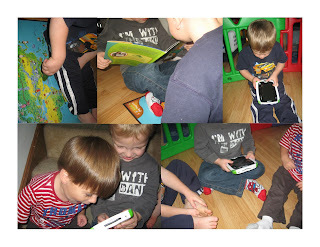 Disclaimer: I received free LeapFrog products in order to host a Learn, Create and Share Party. LeapFrog did not influence my opinions expressed here as a result. I just explored that for the first time at BlogHer, and that is a really cool thing for kids. I liked it a lot! I remember that the early Leap Frogs were frustrating for my grandkids to use because the stylus was attached by a too-short cord. I guess they had to keep it short to avoid a choking hazard, but that could be the reason for the lack of a cord.